Get Your Fused Silica Quote FAST! Which keyword below did you use to find use? Let us know and receive a discount on your order! 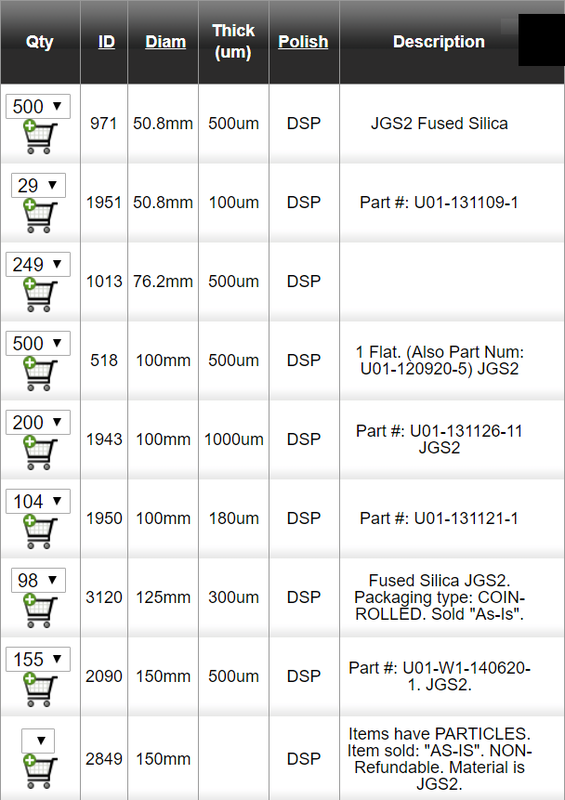 Below are just a small expample of the Fused Silica wafers that we have in stock. We can also custom make any spec! Fused silica is the glassy form of quartz and is thus isotropic. It is tough and hard and has a very low expansion. Normal varieties contain water which gives strong absortion in the IR. Water-free varieties are available. There are different types Fused Silica used for different application. We mainly have three types, including JGS1, JGS2, JGS3. Click here for the application and their equivalent to other Fused Silica supplier and our prices our usually much lower. free of bubbles and inclusions. less expensive than Calcium Fluoride or ZnS Multi-spectral grade.